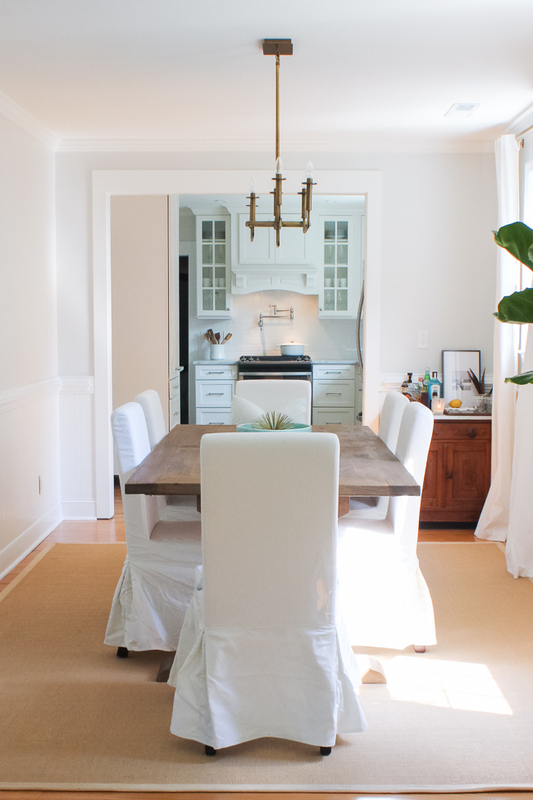 Our dining room is finished! Close enough, at least. 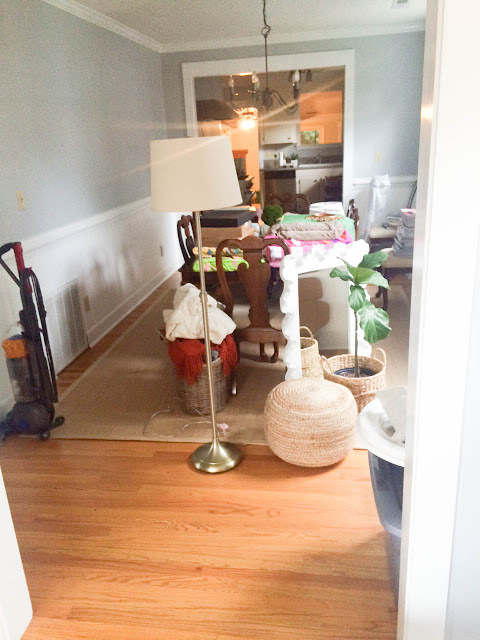 Overall, there was nothing really terrible about the space, but it was in desperate need of a refresh. I mean, the dirty popcorn ceilings, yellowish beige outlet covers (seriously, why did anyone ever think this was a good look? ), and the light fixture that was falling apart…they weren’t the greatest of sights. So, we scraped the popcorn, painted the walls and trim, replaced the outlet covers, added a new light fixture, and changed up the furniture. Boom! 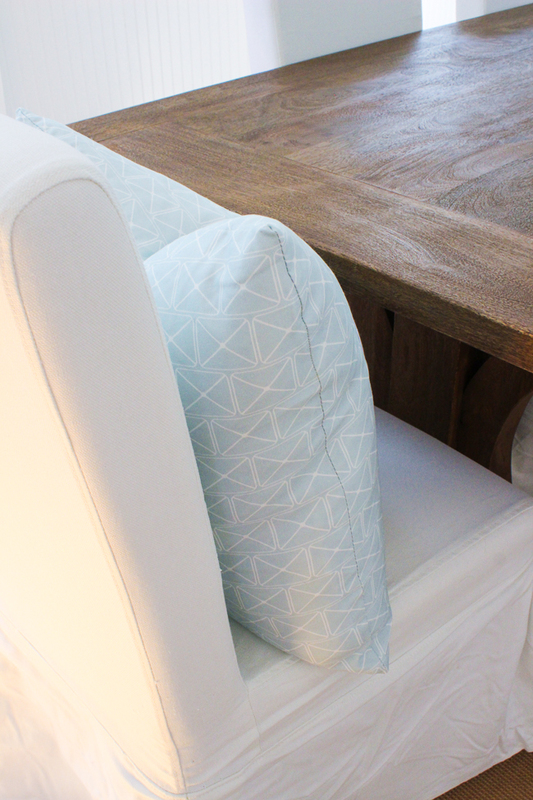 These pillows above are Suite 33 and are a nod to Charleston—the same ones I talked about here! 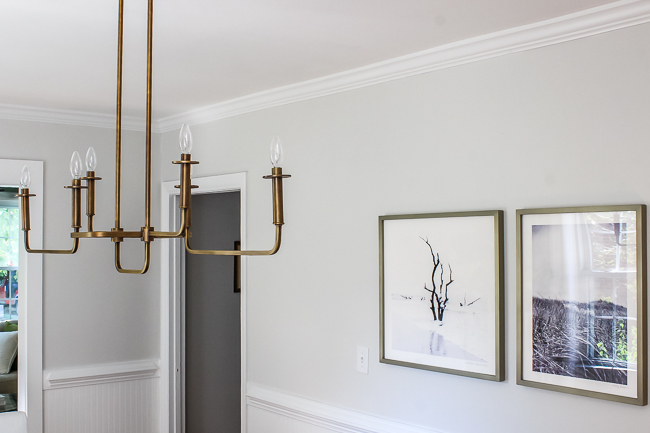 Anyway, I spent about two weeks deciding which route to take with the new light fixture because they have so many chandelier options (seriously, all the heart eyes), but ultimately decided on this Kichler Alden Brass 6-Light Chandelier. I love how it’s linear—the long table really needed a light like this and it keeps the eye moving forward through the room, which is nice since this room is also a walk way from the living room to the kitchen. Having the dining room also serve as a pass-through has always been so awkward for me, but for some reason, now it doesn’t feel weird to me! The room is light and airy, so I don’t feel like I’m dodging furniture to get to another space in our house. If you’re interested in seeing, here are the other chandeliers I was considering. See how it was a struggle!? Speaking of wasting a couple weeks trying to pick out the perfect thing…. 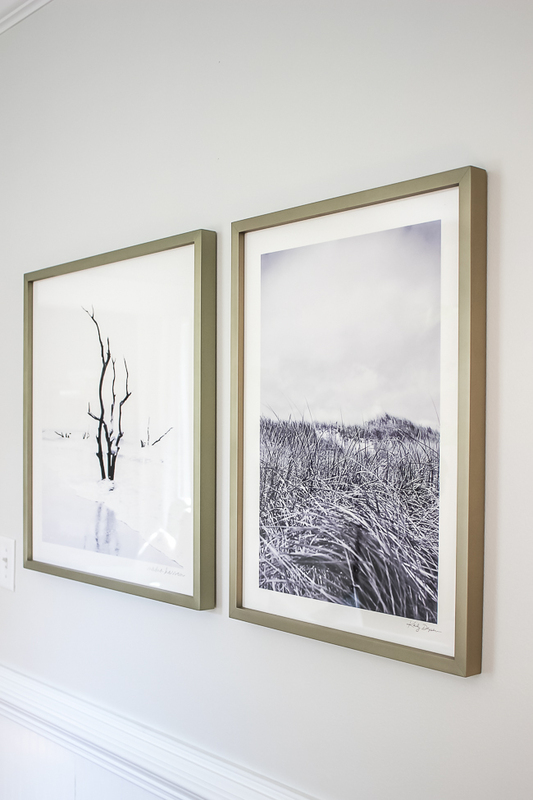 The two framed photographs you see there on the wall are from Minted. I’m in love with their marketplace because it features independent designers from all over the world. I stay pretty local in my choices, though—the “Daydream” print of the dunes reminds me of our beaches and the “Boneyard Beach” print is of Bulls Island in Charleston! I really love how the pieces are the same height but different widths. One of my favorite possessions, this Lulie Wallace painting. 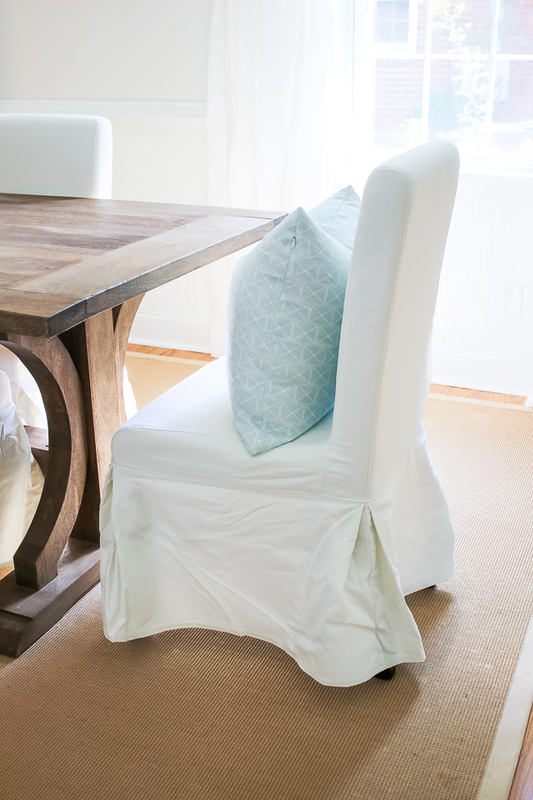 Now, maybe my favorite part—the table and slipcovered chairs. They are from Celadon. I’ve got to give it to my peeps over there because they really are incredible. I’ll skip a really long story about this, but basically, they went above and beyond to help me find the perfect table and I couldn’t be happier. 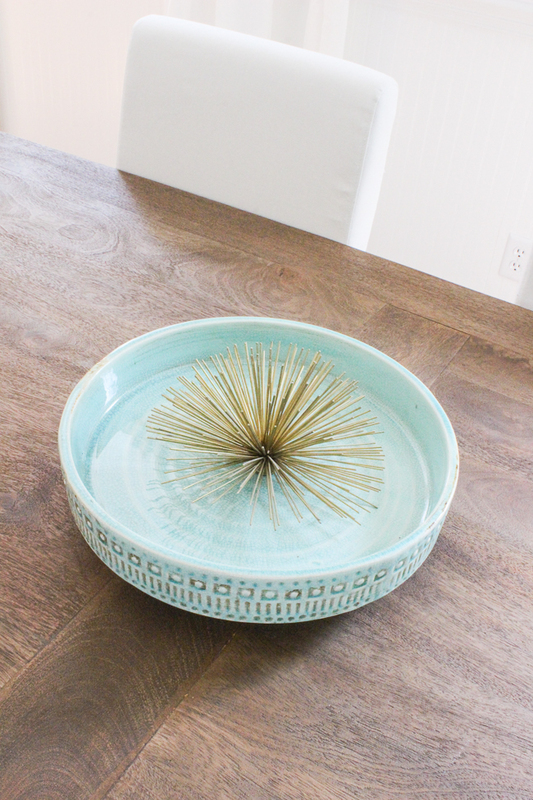 I loved our old table and it’s traditional bones (gave some charm/old vibes to our brand new house we used to own). 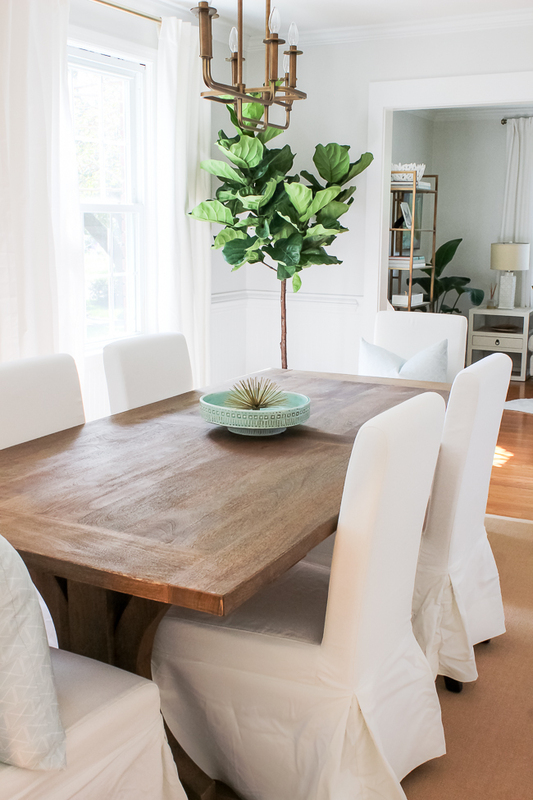 But with this 1940s house, I really wanted a fresher take—and this reclaimed wood table with crisp, white slipcovered chairs was exactly what I envisioned. I picked out the chairs and table at the Celadon Warehouse/Outlet, where they keep the majority of the bigger pieces of furniture. I think they got tired of seeing my face over there (kidding, but not really) because I showed up like twice a week to see if they had gotten anything new in stock. I kept finding gorgeous pieces that would work, but I knew if I waited a bit, I might find something perfect. The buyers at Celadon scour the globe in search of really unique pieces…and because of that, sometimes there may only be one of something in stock! So I didn’t want to miss out on something good. I picked out this table the day it came off the container. If you’re in Charleston, do yourself a favor and stop in the retail store in Mount Pleasant, or hit up the outlet/warehouse if you’re around on a Wednesday, Friday, Saturday, or the last Sunday of every month. SO. MUCH. GOOD. STUFF. 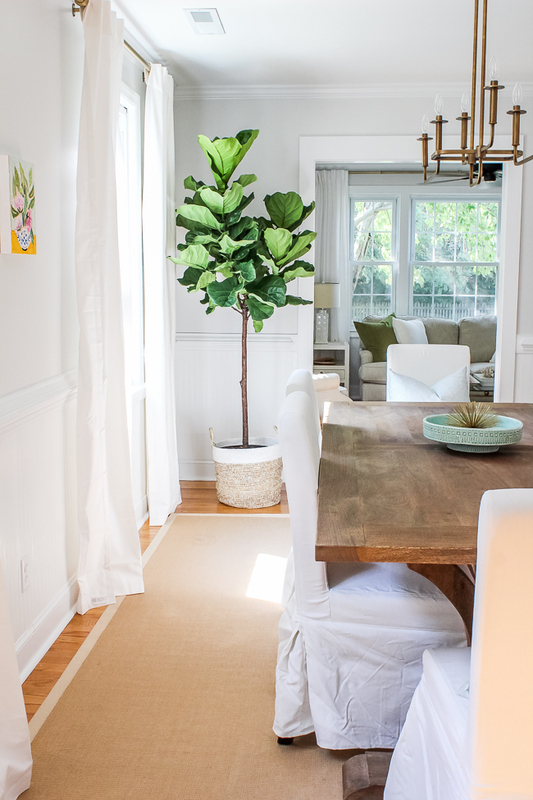 I first talked about the pedestal above in this breakfast nook update! 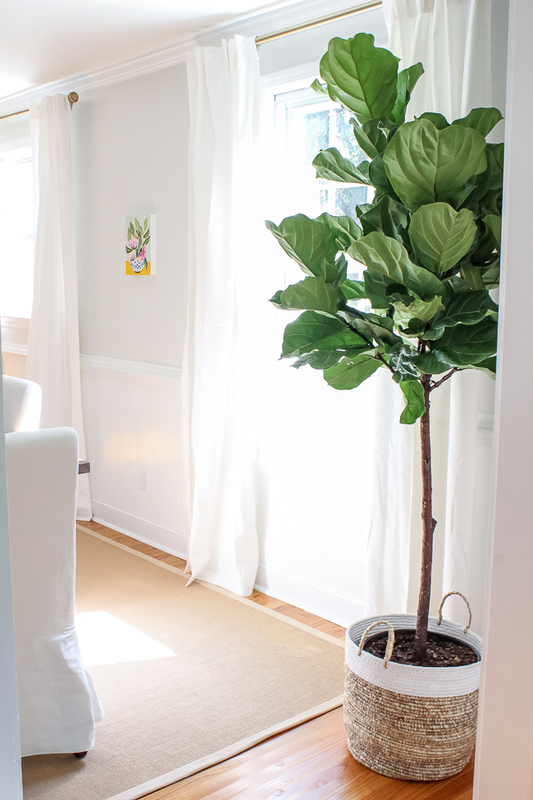 I think I’ll eventually put another piece of artwork on the right wall that is opposite the Fiddle Leaf Fig tree, but I just haven’t found the perfect thing yet. 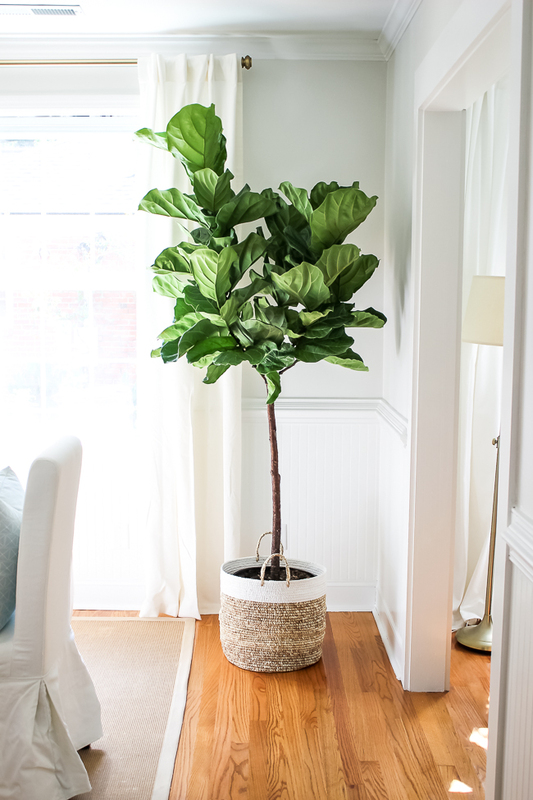 That’s the great thing about simple spaces—you can add. That’s a lot easier than taking away. And my eyes never, ever get tired of a white canvas! Completely gorgeous !!! I love everything about this look ! The dining room looks amazing! I love the white chairs. I'm so curious to hear your honest opinion about scraping ceilings..is it worth the effort of doing yourself? We have about half our house left to scrape and I'm wondering if it's something we can tackle without losing our minds! Megan, I am completely obsessed with your style! Can I move in?! It looks absolutely beautiful, love seeing how everything is coming together! Girl I am obsessed with your house!! It's so pretty!! It's beautiful. I love it!! Your home is gorgeous! 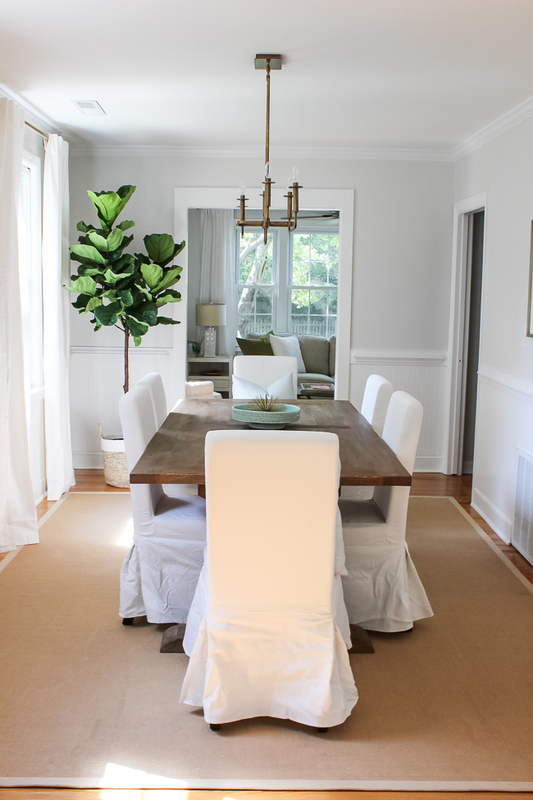 I love this color on the walls – how did you ask them to make the color more gray? I stumbled across your site while researching paint colors for our new home. 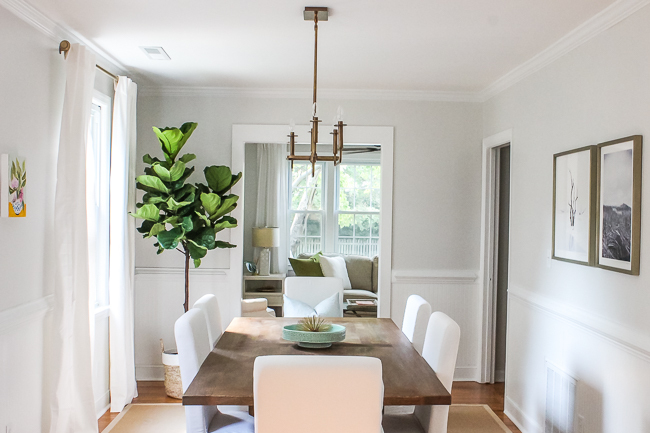 I love this kitchler chandelier in the photo, but when I look at the stock picture of it in the catalog, the brass looks very bright and shiny. In your photo, the brass looks more aged. Can you tell me what the finish looks like in real life? Thanks! I love this paint color. Do you have the formula for the paint color? Usually it will be on the can. Oops! Nevermind, I found it if it’s the same for the living room! What color is your trim? Thanks! 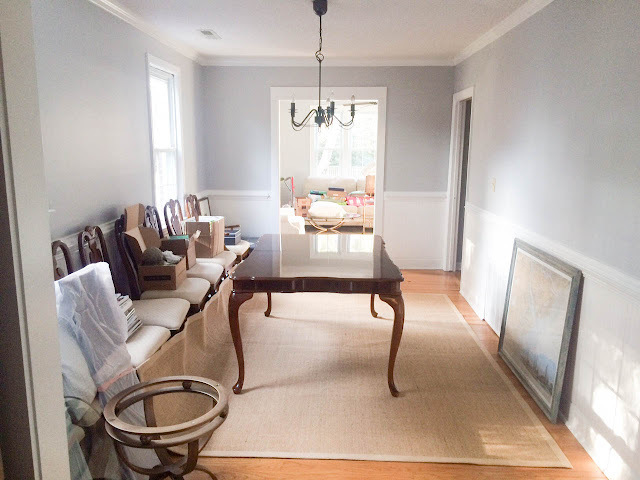 I went through 20 samples of gray paint before I figured out I really wanted white that leans gray. Going to try your paint color in our master. 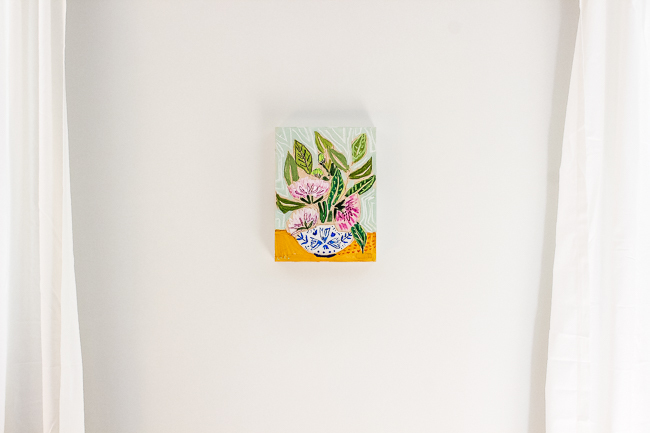 I just wanted to let you know that we had our master bedroom painted Stokes White and liked it so much that the painter is coming back this weekend to paint the rest of the downstairs Stokes White. I tried 22 samples of different grays before I realized I didn’t actually want gray, just white with a hint of gray. Stokes White was perfect! 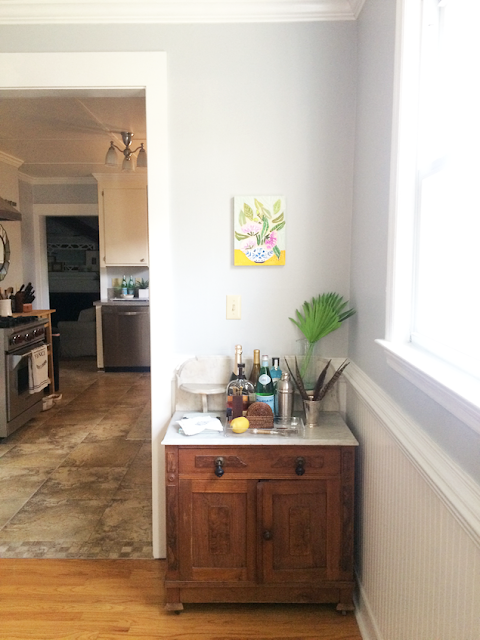 Super random – but the piece that you are using for your bar – I love it! I noticed in the “before” pictures that the washstand has a blackspash of sorts and then does not in the “after” pictures. 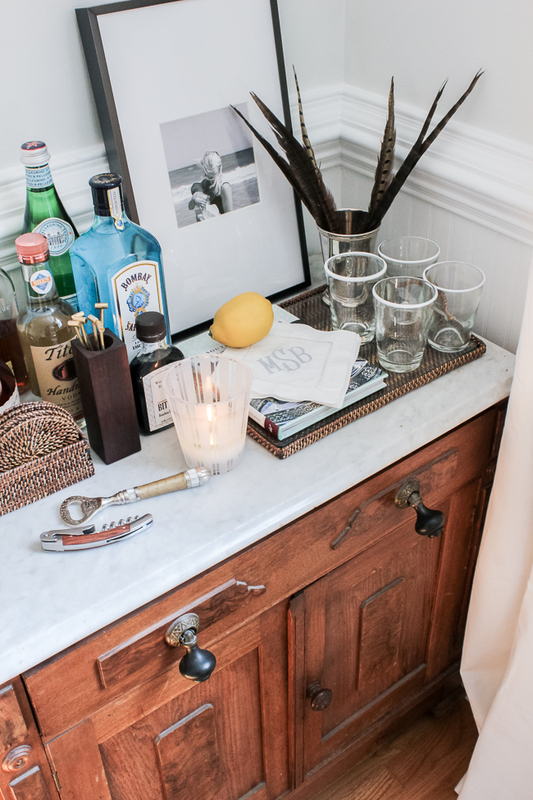 I am looking online to purchase a washstand – but how did you take the back off without ruining the marble? That’s what I would ideally like to do!